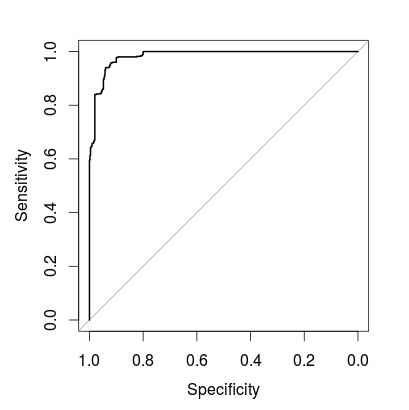 How can I vary classification threshold to produce ROC curves. I am new to R and I wanted to classify in different algorithm. Since the accuracy of ROC plot is high I wanted to change the threshold and try. I wanted to know how to vary threshold ? What is the appropriate threshold value ? To your question: first, if you want to compare different approaches, comparing their ROC curves and area under curve (AUC) values directly will be a good idea, as those give you overall information about how powerful your approaches are on your problem. Second: you will need to choose a threshold appropriate for your goal. The tradeoff with this is that you will need to decrease one of the TPR (true positive rate, or sensitivity), or TNR (true negative rate, or specificity) in order to increase the other - there is no way around this$^1$. So, depending on your problem, you might e.g. happen to need a low false positive rate (FPR = 1 - TNR), which in turn will require you to have a high TNR - so this will definitely depend on details of your problem. $^1$ For completeness: predicted class probabilities from your model are made either a "positive" prediction (usually above the threshold) or a "negative" prediction (usually below the threshold) by this. Please note that training on all data will lead to overfitting, so you should instead use techniques like cross validation and resampling (e.g. with the caret package, as shown above - there you would just need to set method='nnet' for using this model, and could provide hyperparameter in the tuneGrid parameter). Not the answer you're looking for? Browse other questions tagged r machine-learning classification or ask your own question. How to generate ROC Plot for semi-supervised algorithm? How can we calculate ROC AUC for classification algorithm such as random forest?